Susan Page Davis here. Over the past few weeks, I’ve been researching Hannibal Hamlin. 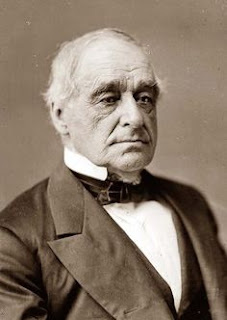 He was a statesman from my home state of Maine, and right now I’m writing a cozy mystery in which a fictional artifact connected to his family plays a major role. Hamlin’s biggest claim to fame was serving as Vice President under Abraham Lincoln during his first term, from March 4, 1861 to March 4, 1965. Hamlin narrowly missed becoming President. 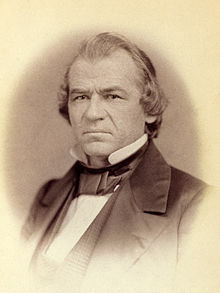 In the 1864 election, Andrew Johnson was elected Lincoln’s second Vice President and replaced Hamlin only 42 days before Lincoln died. Two of Hamlin’s children (Charles and Sarah) were present at Ford’s Theater the night Lincoln was shot. He started out in the Democratic Party, but Hamlin was an active opponent of slavery and switched to the newly formed Republican Party in 1856. 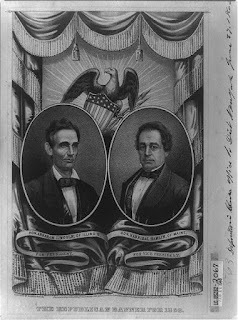 If Hamlin had been on the ticket again in 1864, he would have become President seven weeks after the inauguration. Why wasn’t he on it? 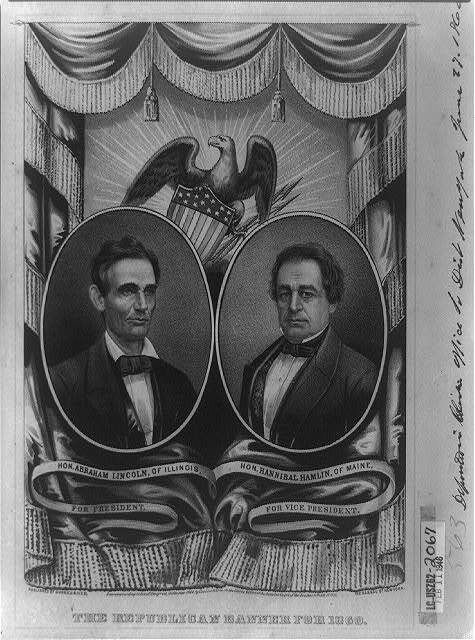 "The Republican Party Banner for 1860"
First, let’s look at why he was on the ticket with Lincoln in 1860. The Republican Party wanted to put an easterner on there with Illinois resident Lincoln, to geographically balance the ticket. Perhaps more importantly, Hamlin was a former Democrat. He could appeal to other anti-slavery Democrats. Hamlin, by most accounts, was not personally close to Lincoln. He served through most of the Civil War and also served a term in the Maine militia during the hostilities. He did not take a strong role in the executive administration, but concentrated more on his role as presiding officer of the U.S. Senate. Confederate States of America, Johnson remained firmly with the Union. He was the only sitting senator from a Confederate state who did not resign his seat upon learning of his state's secession. Lincoln appointed him military governor of Tennessee in 1864, when most of its territory was re-taken by the Union. Many saw him as the best choice for a running mate for Lincoln in the upcoming election. Lincoln was re-elected, but Hamlin left office. After this, Hamlin served as Collector of the Port in Boston for several years. In 1869, he returned to the U.S. Senate, where he had also served from 1848 to 1861, and was named U.S. Minister to Spain in 1881. He had also served earlier as a member of the U.S. House of Representatives and the twenty-sixth governor of Maine. 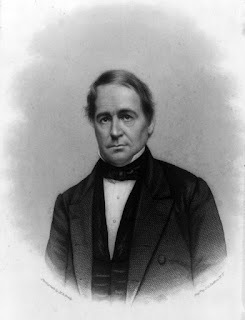 Hamlin was born in 1809 in Paris, Massachusetts, which is now Paris, Maine. Maine was at that time still a part of Massachusetts. He died in 1891, at age 81, in Bangor, Maine. He married Sarah Jane Emery of Paris Hill, Maine in 1833. They had four children: George, Charles, Cyrus, and Sarah. Mrs. Hamlin died in 1855. In 1856, Hamlin married Sarah’s half-sister, Ellen Vesta Emery. They had two children together: Hannibal E., and Frank. Ellen Hamblin died in 1925. In the mystery I’m writing, it’s a fictional incident concerning one of the Hamlin children that enters into my plot. If you’d like to win a different one of my mystery novels, comment below, and be sure to leave your contact information so we can tell you if you won. Winner can choose Mainely Mysteries (three murder mysteries set in northern Maine with a strong faith thread and romance) or Trouble Brewing (cozy mystery where a letter written by General Henry Knox is stolen). Susan Page Davis is the author of more than seventy novels and novellas in the mystery, romantic suspense, and historical romance genres. A Maine native, she now lives in western Kentucky. She is a winner of the Carol Award, Inspirational Readers’ Choice Award, Will Rogers Medallion, and more. Visit her website at www.susanpagedavis.com, where you can see all her books, sign up for her occasional newsletter, enter a month book drawing, and read a short story on her Romance page. Historical photos in this blog are in the public domain and/or available through the Library of Congress. What an interesting post. Thank you for sharing this bit of history. I would love to win any of the books you are offering in your giveaway. I love murder mysteries and cozy mysteries too. Thanks, Cindy! I find Hamlin a very interesting historical character. Yes, Maine was a part of Massachusetts from the time of the Pilgrims until 1820, when it became a separate state under the Missouri Compromise. Maine entered the Union as a free state and Missouri as a slave state. Thanks for taking part, Deanne! Hi Susan. I wasn't familiar with tjis part of our history and I enjoyed learning about Vice President Hannibal Hamlin. Thanks for sharing and for offering one of us a book. I would love Trouble Brewing. Got you entered, Connie. Thanks for taking part. I love visiting HHH and learning fascinating historical tidbits! Thank you for sharing, Susan. Always glad to see you here, Britney! I really enjoy the informative posts from this site. I love history. Thanks for the tidbits about Hannibal Hamlin . I also don't remember about Maine and Massachusetts. Thanks and I'd love winning either of those books,they sound intriguing! this is really an interesting post. I love to learn about history. 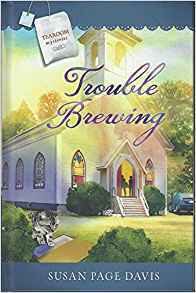 I would love to read your book Trouble Brewing. Thanks, Lori! I'll post the winner here next week. Interesting history and your mystery sounds intriguing with the Hamlin family connection. President Lincoln is one of my favorite Presidents to read about and I forgot about Hannibal Hamilin serving as his first VP. So interesting! I would enjoy reading either of these but would choose Mainely Mysteries.. This month's winner is Marti C. Thank you all for taking part!